Doug DeCinces spent the first part of his major-league career shaking off comparisons to a Baltimore Orioles legend. Then, before he could make his mark in Baltimore, he was traded to make room for another Oriole icon. DeCinces essentially bridged a path between two Hall of Fame infielders, Brooks Robinson and Cal Ripken Jr.
Douglas Vernon DeCinces (pronounced “de-SIN-say”) played major league baseball for parts of 15 seasons from 1973 through 1987. He was born on August 29, 1950 in Burbank, California. DeCinces split a productive career between two American League teams, the Baltimore Orioles for parts of nine seasons (1973-81) and the California Angels the following six campaigns (1982-87). An Orioles fan website chose him as the 16th greatest Oriole in 2006.1 In April 2000 the Angels named him to their All-Time Team as the best third baseman to ever play for the franchise and in 2005 fans at HalosHeaven.com named him the 18th greatest Angel of all time.2 He closed out his major-league career in the National League with a four-game cup of coffee at the end of the 1987 season with the St. Louis Cardinals. He ended his playing career with a one-year tour in Japan in 1988. Before entering college DeCinces starred as a two-sport athlete at Monroe High School in North Hills, California. He played baseball and basketball but fixated on baseball at Pierce College in the Los Angeles Community College District, where he twice earned All-Star Conference honors. After his first year, the San Diego Padres drafted him in the eighteenth round of their first-ever draft in 1969. DeCinces wisely returned to Pierce for his second year. This decision improved his draft status markedly as long-time Baltimore scout Ray Poitevint signed him after the Orioles picked him in the third round of the 1970 draft. In 2010 Pierce College recognized DeCinces’s tenure by inducting him into its Athletic Hall of Fame.4 Pierce’s other baseball inductees include Coco Crisp and Barry Zito. In 1970 the 19-year-old DeCinces debuted in the minors at Bluefield, Virginia, of the short-season Appalachian League.5 He mainly played shortstop but saw action at all four infield positions and started and pitched one game giving up three hits and a run in two innings. His play at shortstop earned him a promotion to the Dallas-Fort Worth Spurs in the AA Texas League. DeCinces stayed in Dallas the next year as they experimented with the 20 year-old at second base with mixed success. He was out for two months from injuries in a June 28 collision while chasing a pop fly. With the Asheville Tourists of the Southern League in 1972 DeCinces displayed his first glimpse of power, hitting 10 home runs and driving in 60 runs while patrolling second base. He continued his versatility during his promotion to Triple-A in 1973 with the Rochester Red Wings of the International League. While he mixed in several dozen games at second base and shortstop he found a new home at third base where he started 99 times. His power increased to 19 round trippers and 79 runs batted in which earned him a 10-game September call-up with the Orioles. In his major-league debut DeCinces hit a game-winning single in his second at-bat to beat the Milwaukee Brewers on September 13, 1973. DeCinces completed his minor-league tour in 1974 with the Red Wings, hitting 11 home runs and driving in 66 runs. This time the Orioles called on him to appear in only one game as they closed out their 1974 season. In 1976 DeCinces increased his playing time starting 103 games at third base while Robinson handled the other 59. He took over third for good in 1977 as Brooks managed to start only 10 games and retired on August 13. Later that year, on September 18, the Orioles held Brooks Robinson Day before the largest crowd in Baltimore history, 51,798. Before the game DeCinces pulled third base from the ground and presented it to Robinson. “Some of the pressure had come back that day…” DeCinces recalled. To remove that pressure, DeCinces hit a three-run homer in his first at bat. “It felt like somebody lifted 1,000 pounds off my shoulder. I think that was the last hurdle for me. To hit that home run on Brooks’s day was a very special thrill.”7 For the next five years (1977-81), DeCinces manned the hot corner for the Orioles and earned his due respect away from Robinson’s shadow. Weaver felt the sting of a player getting the best of him in front of the team. In the hallway Earl continued to hound him and a policeman had to keep Doug from punching him. Between games a calmer Weaver told his players that he may push too hard sometimes but he doesn't hold a grudge. Trying to prove his point, he returned his third baseman to the hot corner for game two. Yet Weaver pinch-ran for him in the seventh inning after DeCinces had doubled to knock in two runs. “I’m not taking anymore. I’d taken it from the fans. I’d taken it from Earl. … I’m not going to let somebody get in the way of becoming who I want to become,” declared DeCinces.9 By physically and mentally standing up to Weaver, Doug DeCinces made a mental breakthrough that would clear his path to his best Orioles season. Before that May confrontation with Weaver, DeCinces had started 1978 slowly. His wife Kristi endured a miscarriage the first day of spring training and he missed five days. His first day back he took a bad hop in the face that resulted in his fourth broken nose. The resulting surgery knocked him out for the next two weeks of training. Later a virus claimed him for ten games in June. But then came July. For the second half of 1978 Doug DeCinces was the hottest hitter in the American League, slugging 21 home runs, driving in 67 runs and raising his batting average 60 points from .226 to .286. He earned Player of the Month honors for July when he equaled a club-record 31 RBIs for the month along with 10 home runs, 12 doubles and a .722 slugging percentage. He then finished his breakout season with a club-record 21-game hitting streak. Another back injury limited DeCinces’ playing time in the early part of the 1979 season. During practice before a game on April 27 he strained his back fielding a bad-hop throw.11 He missed all of May and returned from the disabled list in early June. The injury cut down his production to only .230 with 16 homers and 61 RBIs in 120 games. Despite the dip in his numbers, his return to the club was enough to stir some “Orioles Magic.” On June 22, 1979 in the bottom of the ninth with two outs, DeCinces slammed a walk-off two-run homer to beat Detroit, 6-5. That home run was christened "the night Orioles Magic was born. "12 The crowd went delirious, as the O’s besieged their teammate at home plate. The team went on to finish June with a 23-6 record, winning eleven of those games by coming from behind in the eighth inning or later and played at a .690 clip for the balance of the year (78-35). “…And you never know who’s gonna hear the call. Every game there’s a different star. The “Orioles Magic” song was not quite “We Are Family,” the Pittsburgh Pirates’ rally cry from that same year, but the Birds’ jingle emotionally spurred them to the best record in baseball at 102-57. Doug DeCinces was now headed to his first taste of postseason play. Long overshadowed by Robinson’s fielding, DeCinces’s glove had gained scant attention in his early Oriole years. But even Brooks took notice of the play he made to help clinch the pennant in the 1979 American League Championship Series. “I jumped right out of my seat when Doug made that stop,” Robinson said.15 Baltimore led the Western Division champion California Angels two games to one in the best-of-five ALCS. In Game Four the Orioles led 3-0 in the bottom of the fifth inning when the Angels threatened with the bases loaded and no outs. An easy fly out to left field set the stage for DeCinces’s career defensive gem. Angels’ shortstop Jim Anderson ripped a shot down the third-base line aiming to clear the bases and tie the game. DeCinces lunged toward the line to short hop the drive. He hooked third base with his leg for a force out before springing to his feet to gun Anderson out for an inning-ending double play. “It was the best play I’ve ever made,” claimed DeCinces. “After I got up I had a handful of dirt along with the ball. When I threw to first base I didn’t know where the ball was going.”16 The play ended the Angels' only serious rally. Their manager, Jim Fregosi, said, “If DeCinces hadn’t made the play the game would have turned out differently. If that ball had gone through the score would have been at least 3-2, and I think we would have broken the game open.”17 DeCinces added a single, double, and run scored to help seal the win as Baltimore headed to its fifth World Series. The heavily favored Orioles took on the Pittsburgh Pirates “Family” in the 1979 World Series. This matchup repeated their 1971 encounter, including the same results, Pittsburgh winning in seven games with a celebration on the loser’s home turf. In his first and only World Series, DeCinces came in like a lion but went out like a lamb. He marked his Series debut by becoming the 16th player to homer in his first World Series at-bat, matching his predecessor Brooks Robinson who did so in the 1966 Series. Yet, in his 24 ensuing at-bats, DeCinces struggled with just four singles, finishing with a .200 average. Few of the other Orioles hit any better as the Pirates clinched the Series hitting a near-record .323 to the O’s disappointing .232. DeCinces would return to the postseason again but not with the Orioles. Late in the season, with the Orioles down by six games to the New York Yankees, DeCinces made a remark that upset Orioles owner Edward Bennett Williams and his manager Earl Weaver. “It might be time to call in the dogs and put out the fire because the hunt is over,” DeCinces said.19 Williams pointed out the quote to Weaver who then criticized DeCinces. “It’s the first time I’ve had a player give up with three quarters of a month to go,” Weaver shouted. “… Only one player here is throwing in the towel. Twenty-four others…still think we have a chance…”20 The Orioles finished with 100 wins, yet they still fell three games short of the Yankees. Considering that the Orioles shaved three games off the lead in the last three weeks, DeCinces’s quitter-quote foreshadowed angry feelings that simmered throughout the next year and helped usher him out of Baltimore after the 1981 season. Doug DeCinces always stood out as a vocal leader in the clubhouse. By 1980 he also became the American League Player Representative, holding the position for five years. As player rep he actively fought against the owners over free-agent compensation during the 1981 season. The owners wanted compensation for losing any free agent to another team. The players felt such compensation would weaken the free-agent system. Negotiations broke off on June 12 with a strike and a split season emerged after they reached an agreement in August. Ironically, DeCinces never tested the free-agent market, signing with the Orioles for his second three-year contract that ran through the 1983 season. On the field DeCinces finished the truncated 1981 season with 13 home runs and 55 runs batted in. These numbers prorated to 18 homers and 76 RBIs surpassing both his previous two seasons. His “slash line” (AVG/OBP/SLG) also exceeded both his 1979 and 1980 seasons as he hit .263/.341/.454. However, the Orioles again missed the postseason, finishing in second place for the first half, fourth place for the second half, and one game short of the Yankees overall. Soon after the 1981 split season Baltimore felt it was time for DeCinces to split as well. Despite manager Earl Weaver’s claim that he wanted to move Ripken to shortstop, the Orioles decided to make room at third by trading DeCinces to his home state of California. In February 1982 the California Angels acquired him and left-handed pitcher Jeff Schneider for outfielder “Disco” Dan Ford. Angels manager Gene Mauch had tired of Ford’s behavior while also wanting a third baseman to replace the often-injured Butch Hobson. “The trade was the best thing that ever happened for me,’ DeCinces said. “The change of scenery really did wonders for me.”23 It did wonders for the Angels as well. While Ford’s career began its downslide with Baltimore, DeCinces began a six-year run with the Angels that out-produced his nine years with the Orioles. In fact, he turned his inaugural season with California into a career year. One week in August illustrated just how hot he was. On August 3 he hit three home runs off three consecutive pitches in a 5-4 loss to Minnesota, driving in all four runs. Five days later on August 8 he slammed three more round trippers in a 9-5 win over Seattle. He became only the second American Leaguer and sixth major leaguer to hit three homers in one game twice in the same season. Entering the 2015 season, he remains the only one to do so within one week! Soon after his career week, the Hall of Fame requested his bat for its museum in Cooperstown. Doug DeCinces may never get elected to the Baseball Hall of Fame but he did leave a lasting piece of lumber there. Not even an injury during a brawl could stop DeCinces from having his best year in 1982. In late August he missed three games when he strained his back in an incident with Oakland A’s pitcher Brian Kingman.24 Kingman had thrown one pitch behind DeCinces’s head in a game earlier in the series. When he repeated the message a game later, DeCinces flung his bat past the mound as his signal to scuffle. Despite that brief hiatus, DeCinces finished 1982 setting career highs in virtually every important offensive category; games played (153), at bats (575), runs (94), hits (173), doubles (42), triples (5), home runs (30), RBIs (97), batting average (.301), on-base average (.369), and slugging average (.548). These numbers earned DeCinces 178 votes in the MVP race, good for third place behind winner Robin Yount and ex-teammate Eddie Murray. The Angels rode their MVP candidate into the American League Championship Series where they lost to Yount’s Milwaukee Brewers in five games. The series proved to be painful in another way for DeCinces. In the Game Three loss a foul tip broke his nose but he continued to play out the series. He hit for average in the ALCS, batting .316 with two doubles but the Angels missed his power as he failed to homer or drive in any runs. The Angels expected to repeat as AL West champions in 1983, instead they slipped to fifth. The team retained future Hall of Famers Rod Carew and Reggie Jackson along with DeCinces’s former Orioles teammate Bobby Grich, and stars Brian Downing and Freddie Lynn. Ironically, catcher Bob Boone led this team of All-Stars in games played. A number of injuries limited the playing time of all the other starters but especially DeCinces. He bruised several ribs on June 24 while the Angels held first place by one game over the Texas Rangers. This latest tour of the DL limited the third baseman to only 95 games. At the time of his injury, DeCinces led the league in slugging percentage (.581) and total bases (136) along with 15 home runs and 43 RBIs. His “slash” numbers (.313/.363/.588) were exceeding his career slash line of 1982 and his hot start earned him his first All-Star Game honor. Curiously, although he was on the DL during the July 6 showcase, DeCinces still made an appearance in the fiftieth anniversary of the mid-summer classic, pinch hitting for pitcher Dave Stieb in the bottom of the third. His weak fly ball to center field would be his only appearance in an All-Star Game. By 1983 Doug DeCinces had earned the reputation as a slow starter. For his career he was hitting .244 before the All-Star break. After the break he was averaging .282. This year, however, he started hot hitting above .300 well into June. But he reinjured his back on June 24 and missed the next 51 games. Since July and August were often his best months the timing of his mid-season absence hurt the Angels tremendously. His bat cooled upon his return to the lineup on August 19. By then the Angels were in fifth place 10 1/2 games behind the “Winning-Ugly” Chicago White Sox.25 He contributed a weak slash line of .223/.273/.323 over his final 34 games. It was a bitter year that ended with a thud for DeCinces and the Angels who finished the season 29 games back of the White Sox. Though Doug DeCinces’s option year was 1983, he chose not to test free agency after that injury-filled season. Instead he reached agreement on a new contract with the Angels. Had he waited one more day, DeCinces would have become a Type A free agent that would require player compensation.26 The Angels, however, would not have gotten compensation for him since they were one of five teams that withdrew from tapping the player-compensation pool. This new free agency rule was a product of the 1981 strike settlement DeCinces helped to shape. He signed with the Angels for three years earning $2.25 million with added incentives that could have pushed him to over one million per year. In 1984 DeCinces again started the season in a reversal of his normal trend; he began hot and then cooled. In the 25 games he played in April he hit .306 with 4 home runs and 21 RBIs. In the next 65 games he slumped to .245 with 7 home runs and 24 RBIs. DeCinces stayed healthy for the entire 1984 season and produced respectable numbers with 20 homers, 82 RBIs and a .269 batting average. The Angels also rebounded from their fifth-place finish in 1983 to end tied for second with Minnesota three games behind the Kansas City Royals. The Angels built upon their second-place finish in 1984 by battling Kansas City throughout the 1985 season. Nonetheless, California fell one game short of the division title. DeCinces twice landed on the disabled list and his absence played a big part in the Halos failing to overtake the Royals. First, in May after he struggled to hit .219 with five home runs and 19 RBIs, his balky back caused him to miss three weeks. Then in late August he visited the DL for another 15 days. He ended with respectable numbers hitting 20 home runs with 78 RBIs, but those stats only magnified his importance to the Angels. In his place rookie Jack Howell produced an anemic slash line of .197/.279/.336 with only 5 home runs and 18 RBIs. Losing DeCinces’s production probably cost the Angels more than the one-game margin that separated them from the Royals at the end of the 1985 season. 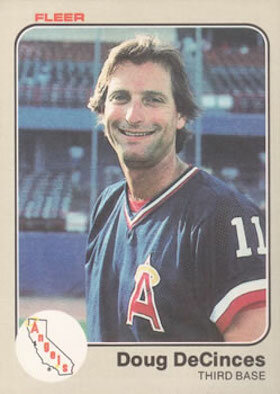 With a healthier Doug DeCinces the Angels returned to the postseason in 1986. This time they outdistanced the Texas Rangers by five games. Playing in 140 games DeCinces never missed more than three games in a row as he led the team with 26 home runs and finished second in RBIs with 96. Back in the 1982 ALCS DeCinces had failed to hit a home run or drive in any runs. This time he managed three doubles, a home run and three RBIs. This series turned into one of the classic battles in league championship history. California won three of the first four games and led 5-2 in the ninth inning of Game Five. But Boston tightened the score at 5-4 on a two-run homer by Don Baylor. With two outs a hit batsman brought up Boston’s Dave Henderson. Henderson worked a 2-2 count off California reliever Donnie Moore. On the next pitch Henderson launched Moore’s forkball deep into the left field seats stunning the home crowd. Somehow the Angels bounced back. After tying the score in the bottom of the ninth they extended the inning and loaded the bases with one out. DeCinces stepped to the plate with a chance to end the game and the series with a hit or deep fly ball. Instead he lifted a short fly ball to right field where Boston’s strong-armed Dwight Evans held the runner at third. Bobby Grich lined out softly to the pitcher to end the inning. Boston scored in the top of the 11th inning and shut the Angels down in the bottom half to extend the series. The shocked Angels then endured two blowouts on the road as Boston easily closed out the series. California would not return to postseason play until 2002, when the Angels won their first World Series. After their shocking loss to Boston in the ALCS in 1986, the Angels sank into a tie for last place with Texas in the AL West. Nearing 37 years of age, Doug DeCinces stayed healthy the entire 1987 season. Yet, when his production declined along with the team, it clearly signaled his time with the club was near the end. When he hit just .234 with 16 homers and 63 RBIs the Angels waived DeCinces on September 23. This move by Angels’ general manager Mike Port saved the team $141,667 prompting DeCinces to accuse Port of poor treatment in their contract negotiations.29 He went from worst to first six days later when the eventual pennant-winning St. Louis Cardinals signed him on September 29. He managed a couple of doubles in nine trips to the plate but was ineligible for the post season and the Cardinals released him on October 7. Doug DeCinces’s major-league career was now over. Regardless of the outcome of DeCinces’s trial, his baseball career stands on solid ground. Honored by two American League franchises as one of their greatest players, and as an All Star and Silver Slugger award winner, he remained steady at third and at bat for 15 seasons. In Baltimore, though sandwiched between two Hall of Fame infielders, he will always be remembered for the “Orioles Magic” he sparked that late June night in 1979. Sources used to supplement the cited endnotes include clippings from Doug DeCinces’ file at the National Baseball Hall of Fame, Cooperstown, NY and the website Baseball-reference.com used for all minor and major league statistics. 1. Camden Chat, O’s HOF Induction On Saturday for Hoiles and DeCinces, August 25, 2006, http://www.camdenchat.com/2006/8/25/25715/8181, Date accessed: June 3, 2013. 2. Halos Heaven, "The 100 Greatest Angels: #18 Doug DeCinces," February 10, 2006, http://www.halosheaven.com/2006/2/10/35134/7353, Date accessed: June 3, 2013. 3. Celebrant Pam, "Personalized Eulogies & Tributes: Celebrating Life, Everyone Has a Story, Ted DeCinces," http://www.celebrantpam.com/memorials/teddecinces.html, Date accessed: June 13, 2013. 4. Pierce College, Athletics Hall of Fame Inductees, Doug DeCinces, 2010, http://www.piercecollege.edu/departments/athletics/HallFame.asp, Date accessed: June 9, 2013. 5. Baseball-Reference.com, all minor league statistics obtained from the Baseball Reference website at: http://www.baseballreference.com/minors/player.cgi?id=decinc001dou, Date accessed: June 2013. 6. Lars Anderson, “Doug DeCinces, Third Baseman,” Sports Illustrated, October 22, 1979, 3. 7. Jim Henneman, “DeCinces Eases Pressure in New Oriole Contract,” The Sporting News, 185, 4, January 28, 1978, 46-47. 8. Ronald L. Mann, “2008 Inside The Game: The Twelve Elements Of Peak Performance,” Doug DeCinces, 16. https://ronmann.com/wp-content/uploads/2012/05/Chapter_%20DeCinces.pdf, Date accessed: July 2013. 10. Jim Henneman, “DeCinces, Dauer Doubled Oriole Pleasure,” The Sporting News, 186, 16, October 21, 1978, 49. 11. Ken Nigro, “Orioles’ New Lament: ‘Oh, Our Aching Backs,’ The Sporting News, 187, 20 May 19, 1979, 17. 12. John Eisenberg, From 33rd Street to Camden Yards: An Oral History of the Baltimore Orioles. New York: McGraw Hill Publishing, 2001, 335-336. 13. Allen LaMountain, Appalachian League Baseball: Where Rookies Rise. Bloomington, Indiana: Xlibris Publishing, 2014, 95. 14. Ray Frager, Baltimore Orioles (Inside MLB), (2011). Sportzone Publisher, 24. 15. Ken Nigro, “Orioles Soar to Crest of AL,” The Sporting News, 188, 16, October 20, 1979, 30. 16. “'Legend’ Brooks Leads Cheers for DeCinces,” The Sporting News, 188, 16, October 20, 1979, 11. 18. Ken Nigro, “Real DeCinces An Oriole Puzzle,” The Sporting News, 188, 22, December 1, 1979, 57. 19. Ken Nigro, “Final Season For Lee May?” The Sporting News, 190, 15, October 11, 1980, 26. 21. Ken Nigro, “Same Old Story: DeCinces Is in Pain,” The Sporting News, 191, 18, May 2, 1981, 20. 22. Arthur Hirsch, “DeCinces’ Follow-Through Leaves Him in Good Position,” Baltimore Sun, June 30, 1994. 23. “Change Did Wonders For Ex-Oriole DeCinces,” The Star-Democrat, March 29, 1983, 13. 24. “Football Season Already?” Santa Cruz Sentinel, August 16, 1982, Sports Digest, 16. 25. Richard Worth, Baseball Team Names: A Worldwide Dictionary, 1869-2011. Jefferson, North Carolina: McFarland Publishing, 2013, page 1220. 26. Murray Chass, “DeCinces Shuns Free Agency,” New York Times, October 21, 1983. 27. Rich Tosches, “Derailed on the Orient Express: Long, Painful Career of DeCinces Ends Amid Indifference in Japan,” Los Angeles Times, November 20, 1988, 1. 28. Murray Chass, “End of the Owners’ Error: The Collusion Checks Are In,” New York Times, May 25, 2004. 29. Fernando Dominguez, “Finally DeCinces Not Feeling He’s Disenfranchised,” Los Angeles Times, August 5, 1995. 30. Rich Tosches, “Derailed on the Orient Express: Long, Painful Career of DeCinces Ends Amid Indifference in Japan,” Los Angeles Times, November 20, 1988, 2. 34. Anderson, “Doug DeCinces: Third Baseman,” 3. 35. Amanda Comak, “DeCinces Enjoying Life as Businessman,” MLB.com, August 14, 2008, http://m.orioles.mlb.com/news/article/3307259/, Date accessed: November 22, 2014. 36. “Doug DeCinces Named to Orangewood Board,” Los Angeles Times, February 23, 1989. 37. “Doug DeCinces’ Friend Charged,” Associated Press, September 25, 2014. 38. “SEC Charges Former Baseball Player and Three Others with Insider Trading,” U.S. Securities and Exchange Commission, August 4, 2011. http://www.sec.gov/news/press/2011/2011-161.htm, Date Accessed: February 8, 2015. 39. “Former Baseball Star Doug DeCinces Indicted For Insider Trading,” Chicago Tribune, November 28, 2012. 40. Aebra Coe, “Ex-Orioles Player Call Insider Trading Charges ‘Stale,’” Law360, New York, November 4, 2014. http://www.law360.com/articles/593123/ex-orioles-player-calls-insider-trading-charges-stale, Date accessed: February 10, 2015.